Last Friday saw the reinstatement – after a hiatus of five years – of the Chairman of Cornwall Council Members versus officers cricket match. The Councillors team were ‘pressed’ from the various political groups at Cornwall Council. Many of which had not held a cricket bat since they were at school. The match was kindly hosted by Truro CC who allowed their wicket to be abused by many of the batsmen. As for the match, it was a light-hearted event with a lot of good natured sledging. However, most of the sledging came from the Councillors highlighting the lack of skill within their own team. After 20 overs, much of it in the rain, the officers took the honours by 12 runs. Of course the ‘political spin’ to this win was the Councillors allowed the win as part of an officer moral boosting exercise. However from anyone watching the game would have quickly realised the Councillors team – apart from four members – lacked any skill. To highlight this, the Councillors got more Ducks than is found on the average duck pond. The good news to the match is it raised £900 for the Chairmans Charity. Which is a fantastic achievement. A huge congratulations to all those who organised this successful event. On Monday 18th March, Cornwall Council’s Cabinet is meeting to implement the totally unnecessary and avoidable cuts to services and staffing that now will have to be administered post the council’s budget decision. By not putting up Council Tax for less than the price of a (weekly) chocolate bar, the council has to find an additional £4.672 million in savings, or better described as cuts. This is despite the Section 151 clearly giving her professional view that by going for a headline catching 0% will make services undeliverable, or heavily reduced. So where are these extra cuts coming from? Are they just the highly-paid consultants that has been the justification for this budget? Put simply, no. These cuts are coming from contracted staff and vital agency staff used to cover for important positions, as without these types of staff, services would not be delivered. For Adult Care and Support, cuts to the budget amounts to £840,000. The majority will come from staffing which could lead to short notice and I hope temporary closure of services like day care centres who reply on the flexibility of agency staff to cover staff sickness, maternity and other valid reasons. So much so, the Conservative Councillor who has responsibility in this area has resigned from his party in disgust on the budget decision. Children, Schools and Families will have an eye-watering cut of £906,000. This directorate used agency staff to work within Children’s Social Work and Children’s centres. The savings will be delivered by reviewing and reducing agency staff, extending recruitment times for vacancies, which could potentially lead to saving having to be made to frontline services. Face to Face services which includes the contact centre will have to find £358,000. Out of that amount, £270,000 will be delivered by reducing the operating and opening times of libraries and one stop shops, and by reducing the opening hours of the contact centre. This will probably be implemented as quickly as possible. This is no spin, this is the harsh reality of the budget. The Chief Executive’s department has been told to find £674,000 in savings. Various reorganisations will have to take place within that department, which will lead to permanent staff losing their jobs with the remaining staff having to pick up their work load and/or seeing services reduced. At least 18 permanent staff will lose their jobs due to this cut. Finance, the very people who help keep the council running in a stable financial footing will lose £320,000 from their budget. At least 12 permanent staff will go, resulting in the provision of minimum statutory cover and the loss of preventative work in fraud. Other departments will see the following cuts; Environment, £387,000; Legal, Democratic and Procurement service, £122,000; Information Services, £488,000. This is on top of the £170 million in cuts that have to be carried out as part of the four-year budget. No one likes to put up Council Tax, and Cornwall Council has not raised Council Tax for the last two-years. However, costs go up and services have to be provided. You also need people employed to provide those services. This budget has resulted in unnecessary cuts that could have been avoided. I really believe if there was not an Election so close to the budget, Councillors would have provided a sensible and deliverable budget. But short-term headlines and campaign bragging-rights have been put before service delivery. The impact on the recent budget decision is starting to become a hash reality. The spin behind the budget was to cut consultants spending, but in the real world it is effecting contracted staff. Yesterday, staff who come under the heading Strategy, Localism and Comms were given a briefing by Heads of Service on the cuts to their services. It is a meeting that no staff should have had to attend if Councillors had set a realistic budget, and not one for a catchy headline. Staff were told five jobs would be cut from Localism, six from Strategy and three from Comms. These are not consultants, or agency staff. This is just the start of the budget decision taking effect. Those departments that are in the firing-line will be asked for voluntary redundancies. If not enough people come forward then there is little option but to go down the line of compulsory redundancies. I have to say these jobs are not extra jobs, but jobs that deliver services. If there is no one employed to do these jobs, then the service stops, or is heavily reduced. No doubt other service heads will be briefing their staff on cuts to their services in the next few weeks. Cornwall Council is not a fun place to be at the moment. People are very worried, and they have ever reason to be. Kevin Lavery: should I stay, or should I go? “I have enjoyed my time as the Chief Executive of Cornwall Council and will be sorry to leave the authority and Cornwall” he said. “I now need to consider the terms of the offer very carefully and discuss this with my family before making a final decision”. “I will be spending the next few days considering this offer and hope to make an announcement early next week. So what now? That is a difficult question to answer for a few reasons. The first one is if he goes, how much time would he have (or need) to serve out before he is released from his contract as the new job starts in March 2013. There are calls for him to serve out his full notice period and no golden goodbyes. Though for the latter, I would think there would be none, as he is leaving on his terms. However, if he does not take the job how what then? Well for me, and I am sorry to say this, but I think his position is now untenable due to him seeking employment elsewhere and that being public. Having the most senior council officer actively seeking employment elsewhere is not good for the stability of the council. Having confidence in the CEO is a must, but more so when 2013 is likely to be a difficult period what with the harsh grant cuts from central Government. If that officer is looking elsewhere, how can we be sure we are not going to be left in the lurch if that perfect job comes along? At least with the upcoming Christmas period people have time to reflect on what to do next. For the council it needs to decide if it wants to be replaced the CEO, as under new rules a council does not have to have one, or it could share one. After all the Isles of Scilly could soon have a vacant position as well. I will say, Kevin is a good officer, I might not have always agreed with some of his views, like outsourcing, but he has managed to turn seven authorities into one. That is no mean feat, and that should be recognised. The decision of Cornwall Council’s Cabinet to approve the proposal for ‘Shared Services’ has angered many Cornwall Councillors outside of the Cabinet. The information on the proposals has been limited to those who are not in the Cabinet. If the information to back-bencher’s is limited, you can bet the information for the public is even worse. The Cabinet’s reason for this sell-off is to save money, and create jobs. At face value, you can understand those reasons, but look behind the words, and you get to think how will this be done? Take for example Stuart Roden’s view as Unison spokesperson. On the scenario referred to as “the J curve” could see fewer jobs in Cornwall before all the new jobs were created. I am sure the 1000 or so staff which will be ‘transferred’ are really happy with the scenario of the J-curve. Worse, and from my understanding, those staff that are transferred would not be able to apply for internal jobs at the Council either! How do you feel with Libraries; One Stop Shops; Benefits, including housing; adult care, free school meals; customer services being run by a private company? A lot of spin has been said about this not being privatisation, but it is, as you are giving these services to a private company to run. Even the Council Tax we pay to Cornwall Council will be given to a private company to collect and run. How is that possibly right? It will be the same for Business Rates. I would like to see how sympathetic this private company is to those who might find themselves in financial difficulty. I think we all know the answer to that. “Literature on shared services show that all of the ‘evidence’ for sharing comes from estimates, projections (to make the savings sound big) and surveys. No of which represent actual evidence. Additionally all of the evidence is being generated from within the shared services industry (IT software sellers, private BPOs and consultancies). In recent years thinktanks have become vehicles to wash the evidence clean of any bias, reports been produced that are flawed and do not take the facts into account or are based upon reports from those services already sharing”. Southwest One, the joint venture between IBM, Somerset county council, Taunton Deane borough council and Avon & Somerset Constabulary, was launched in 2007 with a plan to save £192m by sharing back office functions. So far it has recorded a pre-tax loss over its three financial years, with the latest loss peaking at £16.5m. Yet managers claim to have made £3.3m in cashable savings. Clearly I need to learn something about accounting – how can you make “savings” at the same time as filing such major losses? It is also reported that a problem with the accounting system has led to duplicate payments worth up to £772,000 and £12.9m in outstanding debts. Meanwhile Southwest One leaders maintain that it can still achieve the promised savings for its partners. I am certainly not happy, and I am in the process of doing something about it. £20k for One Days Work? It does make you wonder what is going on at Cornwall Council with the latest ‘good idea’. 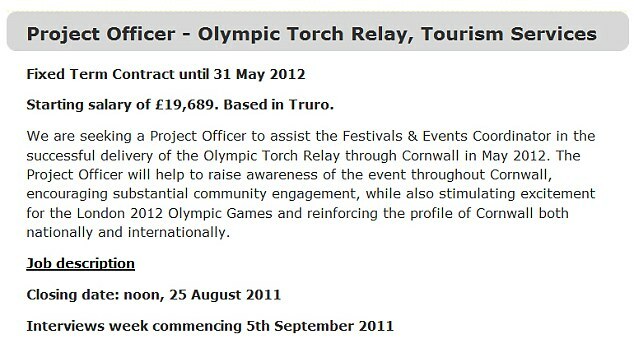 This so called good idea is to hire a new member of staff to coordinate the Olympic Torch travelling though Cornwall for one day. You would think the Council could find someone currently employed within the organisation to carry out this work. Does it really require the council to hire someone for six months (Oct 2011 till May 2012) on £20k to organise the route which covers 84 miles? From the details provided if the person employed for this was hired for a full year we would be paying them £40k. It is also not clear if there are any additional payments like travel, relocation, or accommodation would be paid. I am sure there will be some very miffed staff at Cornwall Council once they find out about this. This position is advertised via Cornwall Development Company (CDC) website. CDC is a wholly owned by Cornwall Council. UPDATE: CDC have sent out a press statement clarifying the position and actual salary of the torch coordinator. The actual wage that will be paid to the successful applicant will be £13,126. Maybe the next time an advert is placed it gives out the correct information, or adds the words Pro-Rata next to the salary. I would hate to be the applicant who applies, only to find out near £20k turns out to be £13k. The fallout in the continuing saga of consultants at Cornwall Council continues to roll on like the preverbal snowball rolling down the hill. I am really getting really fed up with amounts we are still paying. On one hand I was asked to support cuts to the budget because of the difficult times we live in. In the end I reluctantly supported these cuts because of the severe reduction in grants from central government. Now, I am wondering why I did, especially when you find out that we are spending millions (10s over the year) in a few short months on consultants. People are losing their jobs, not just at the council, but in all public sector jobs in Cornwall. Last year 256 people lost their jobs at Cornwall Council (outside of schools). This year a further 360 posts are to go. This might not seem a high amount until you add the 1657 post currently vacant. Near two-thousand posts lost or not filled. This shortfall of staff adds more pressure to the remaining staff. Consultants no matter what skills they bring hardly contribute to the Cornish economy. Most will live outside of the county (and country), therefore the majority of fees paid to them will not be spent in the Cornish economy. At least by employing staff the money stays in Cornwall. It seems the only growth sector at Cornwall Council is consultants. It is not as much as a gravy train, but caviar trains.